The regular football season almost comes to an end. The leagues are finished in many countries and the Champions League final is the real closure for this 2017-2018 club football season. So now it’s slowly getting the right time to talk about the upcoming World Cup 2018 Russia. In this post we give a first preview on two teams we expect to perform on the highest level this summer. The first country to mention is Brazil. There hasn’t been a tournament where the record World Cup winners didn’t belong to the favourites. No exceptions made for this tournament. Brazil has a very strong squad and as always a lot of attacking talent. Brazil will play for the title with the likes of Gabriel Jesus, Philippe Coutinho and of course Neymar. The latter had some rest in the last part of the season, but he is recovering very well. Another team that’s always one of the favourites to win the World Cup. The current title holder has once again one of the best squads for the World Cup 2018 Russia. When you can leave a regular first team defender at Arsenal out of the squad, you know the team is very strong. The only concern for the German is Manuel Neuer. The Bayern Munich goalkeeper has been out for almost the entire season, but he looks to be recovered just in time. On the other hand, if he can’t play, they still can use Fc Barcelona goalkeeper Marc-Andre Ter Stegen. Whichever one is going to play, Germany has a serious chance of retaining their title. 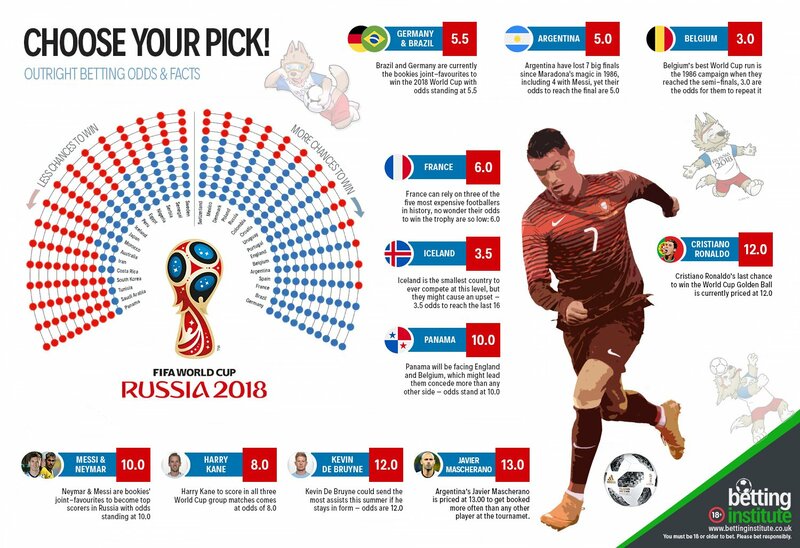 Are you convinced one of these teams is going to win the World Cup 2018 Russia title? We found a World Cup 2018 betting tips website which can be useful by making your bets. Keep an eye on our site for the next few title candidates. Don’t you rate Spain, Belgium and current European champions Portugal?